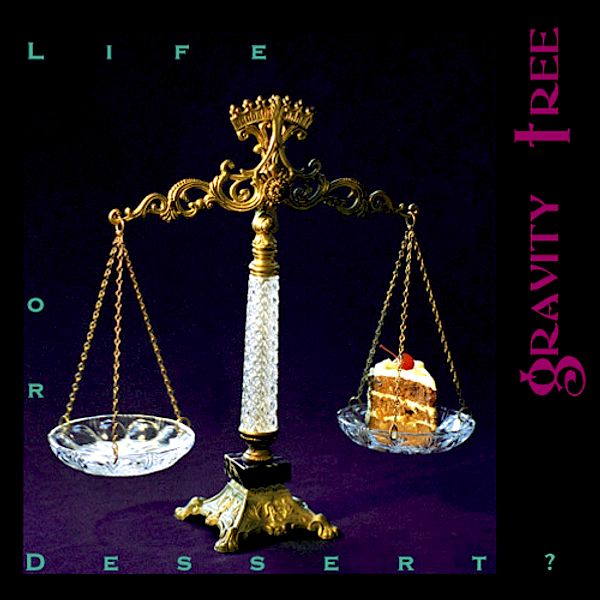 Exposé Online » Reviews » Gravity Tree - Life or Dessert? Gravity Tree — Life or Dessert? A complete surprise out of left field, Gravity Tree is the duo of Linc (lead vocals, acoustic and electric guitars, basses) and Alan Nu (vocals, drums, percussion, and synthesizers), playing together since the 80s, based in the SF bay area. Their very full sound is, of course, based around guitars, working in a song-oriented progressive rock vein, rich with harmonies and melodic hooks but steering far clear of anything that could be considered commercial. Word has it that the duo does it all live – Linc with a customized twin-neck bass / guitar and Nu with keyboard and synth triggers on his kit, and have been performing live this way for years. Their sound is a very original one, not easy to pin down with a few common comparisons, though certainly some King Crimson influences are evident (further reinforced by Linc’s occasional Wetton-like vocals), as well as Rush. But none of these influences affects the strong melodic sensibility that pervade each of the disc’s 12 cuts; A more obscure, but accurate reference might be Canadian band Terraced Garden, although when Gravity Tree gets down to business it’s a much heavier attack, with snarly distorted guitars and a brutal bottom end, driven by Nu’s superb and often complex drumwork. Plenty of highlights: “Harmonic Indulgence” with a tricky two-part vocal refrain and angular rhythmic pattern, with a center solo section recalling guitarists from the ECM stable; the title track with its powerful refrain of symphonic fusion; and the closer, “Three’s Two,” opening with a brilliant acoustic guitar solo under a repeating electric structure. Much to recommend herein. Do I Smell Burning Fur?